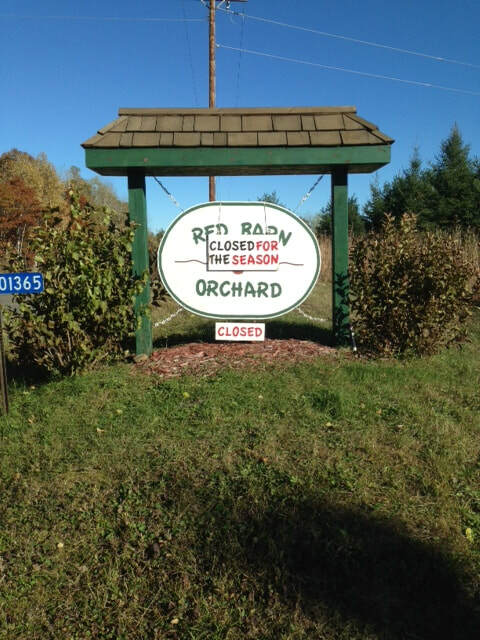 The orchard is now closed for the season and we want to thank all of you who came out and enjoyed the season with us! Over all, we had a good year. Mother nature always seems to throw us a curve. And this year was no different. In the end, it makes us all stronger. 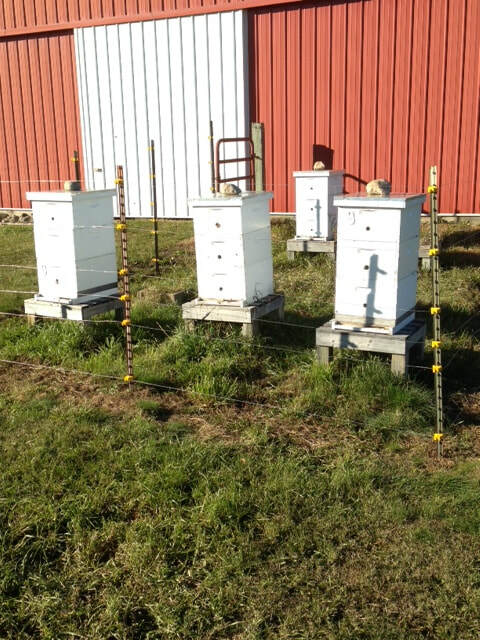 the bees also had a good year and now comes the chore of getting them through the winter in one piece. As long as they have enough food and the mites are under control, they should be fine. I have had fairly decent luck getting them trough the winter, but I have lost bees. I was told in the very beginning that you will loose bees and if you cant deal with that, then you shouldnt raise them. Its really no different than raising just about anything. For now, anyway, its time to put the bees and the trees to bed for the winter and enjoy the remaining fall season. Thank you all again and we will see you next fall! There are just a couple weekends left to the apple season. If you have been waiting for the right time, that would be now. 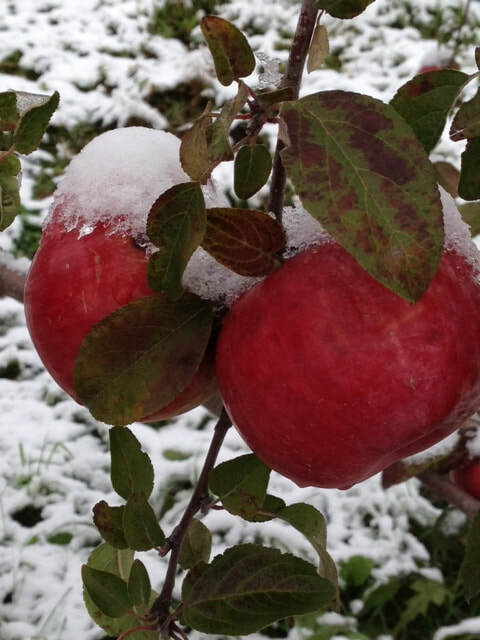 This weekend, we will be picking Snow Sweet and we will start picking Connell Red. Snow Sweet has a nice buttery flavor to it and it also is an apple that doesnt turn brown right away as most apples do. It is a crunchy and sweet apple that you need to try. We will also have the last of the Sweet Sixteen and Haralson seconds. 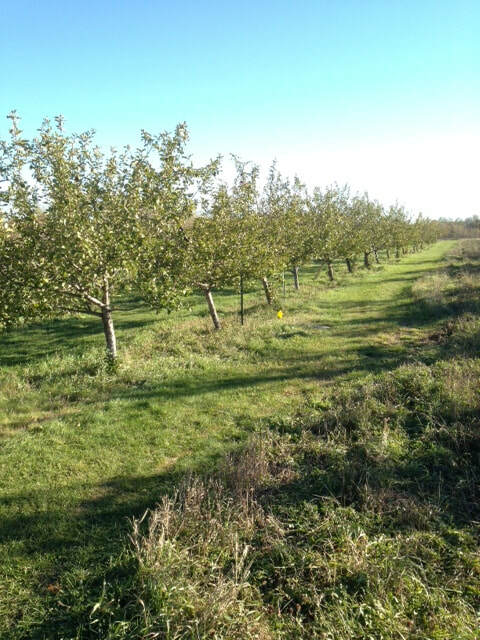 I cant think of anything better than being in the orchard on a crisp fall day with a hot cup of cider in hand. Its Minnesota at its finest. The season overall has been a good one to this point. We have had some wet weekends, but overall, it hasnt been too bad. the last few varieties that we have seem to sweeten up with alittle frost and mother nature has cooperated with that. Come on out this weekend while there is still time. We will have both cider and honey as well as apples. We always make our cider on Fridays, so if you want some, dont wait too long to come out. We have sold out the last 3 weekends. I'll also have a nice bonfire going for you to enjoy your cider by. See you then! Fall is here and we only have a few weeks left. This weekend we will be picking McIntosh and we will start picking Snow Sweet. There are a few Sweet Sixteen and Honey Crisp left but I dont think they will last too long. After that we will have Haralson. We have had so much rain this summer that the Haralson have what is called sooty blotch. It doesnt hurt the apple in any way, it just makes it look dirty. It is easliy washed off. But since I am not going to hand wash 200 bushels of Haralson, we will be offering a discount on them. They are what I would call seconds. There just not as pretty as they should be. So if you are looking to add to your freezer for the winter, be sure and ask about them. When you grow anything on any kind of scale larger than your average garden, you will run into these things from time to time. I have had sooty blotch before (its kind of hard not to get it in some way) just never to this degree. It is caused by excessive rainfall and high humidity. We have had both all summer. Anyway, the remainder of the fall looks good. The very last apples this year will be Haralson and Connell Red. On top of that, we will also have both cider and honey. the cider has been flying out the door so we will try to make alittle extra tomorrow night. Its going to be chilly this weekend so stop out for a bag of apples and a hot cup of cider. 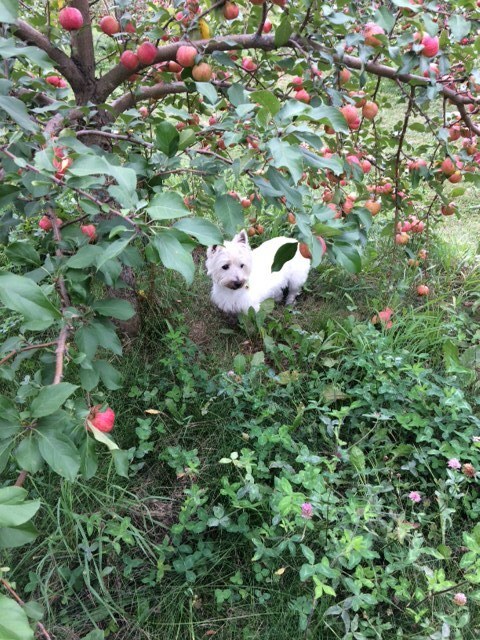 Lexi will be hiding somewhere in the orchard too! Who doesnt love a freshly picked apple? 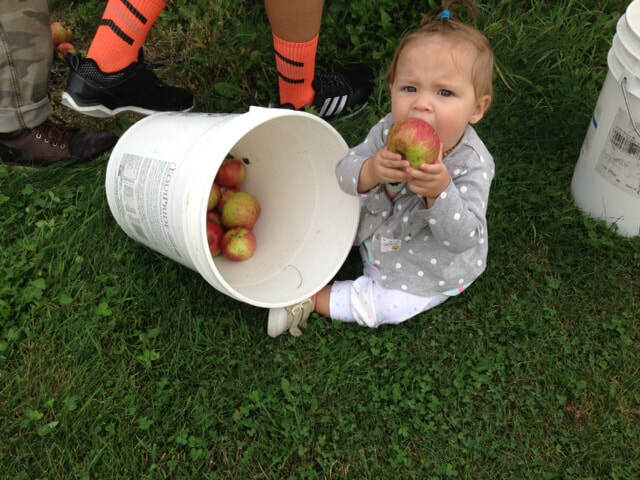 That is my granddaughter eating her first apple right off the tree! 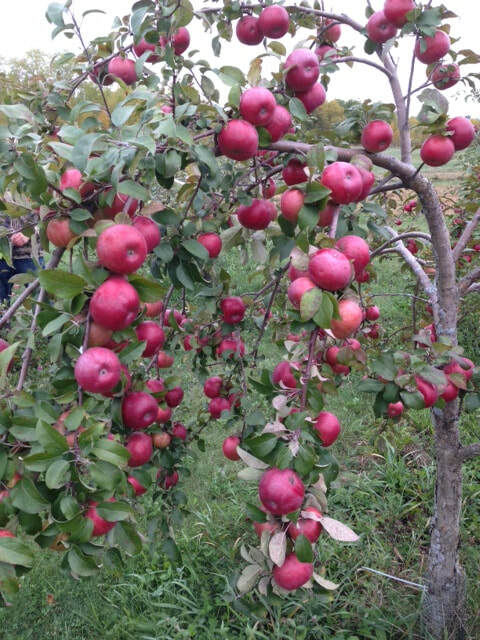 This weekend we will be picking the last of the Sweet Sixteen and Honey Crisp. We will also start picking McIntosh. A very delicious apple. Its crunchy, tart and alittle sweet. Good for anything from pies to apple sauce or eating right from the tree! I think next weekend we will start picking Haralred. They are almost identical to a Haralson except the Haralred is alittle more red in color and they ripen just a bit before the Haralson. Along with that, will be Snow Sweet. They should be ready in a week or so. I'll let you know when after I try one and see. Thats a benefit of having an orchard. I get to try alot of apples and at different times to see whne they are just right. We will also have both cider and honey this weekend too. Fall is finally here and the cooler weather will help the apples for sure. See you then! The time has arrived! 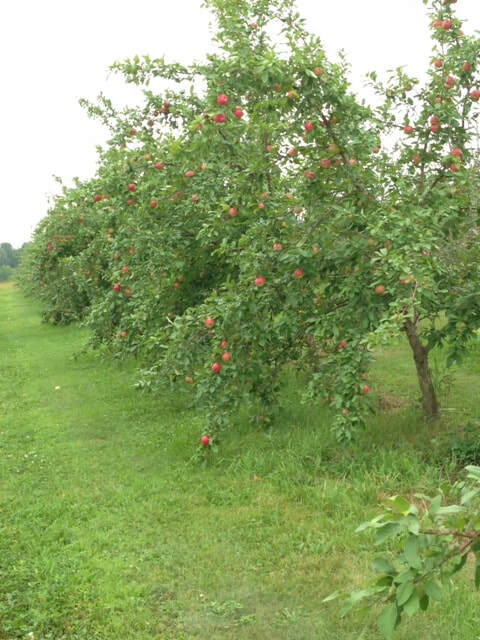 This weekend, we will start picking Sweet Sixteen and Honey Crisp. We will also have the last of the Zestar and Goodland. The crop of Honey Crisp is about like last years crop. Not huge by any means, but I would call it an average crop. 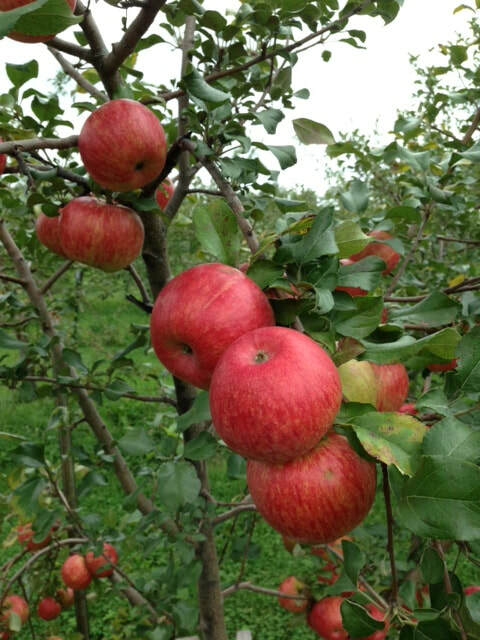 Honey Crisp is a difficult apple to grow and we are the northern edge of growing it. The winters give the trees a real beating. Thats why we planted so many in the first place, because we knew how difficult it was going to be. On the horizon will be Haralred / Haralson and Snow Sweet. They should be ready in a few weeks. McIntosh should be ready by next weekend. This is prime season, so if you like apples, we will have plenty. We will also have cider this weekend and we still have a very good supply of honey. See you this weekend! Even though fall is not here yet, the feel of it is! These cool nighttime temps will help things along. This weekend we will be picking Zestar and Chestnut Crab. The Zestar this year are outstanding as always. Without a doubt one of my favorites. Its also a warm up to whats on the horizon. Honey Crisp and Sweet Sixteen. I anticipate both will be ready by next weekend. Those will be followed by McIntosh and Snow Sweet in 2-3 weeks. We have a total of 14 different varieties for you to try and the majority of them are ready during the month of September and into early October. This weekend looks like its going to be perfect, weather wise, so come on out and try some cider and a bag of your new favorite apples! 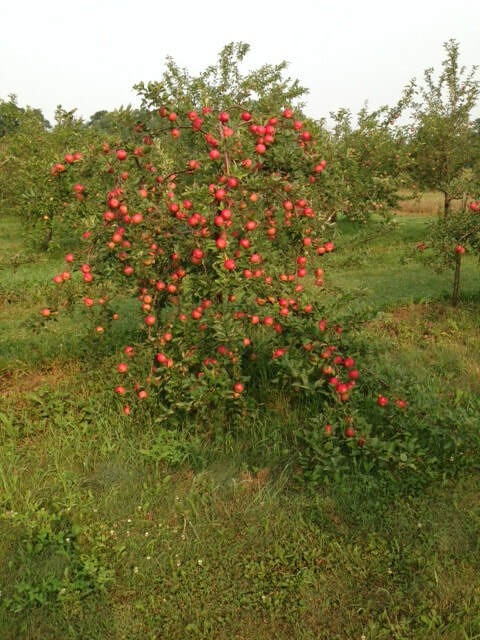 Its time to start picking one of the more popular apples....Zestar. An excellent apple. These are usually bigger than your average apple. They are crunchy and sweet and one of my favorite ones too. We will also be picking Chestnut Crab and the last of the State Fair and also the last of the Hazen. I've said it before, the Chestnut Crab is like a little Honey Crisp. Try one and you'll see what I'm talking about. As the weather begins to cool down, we will get a steady supply of different varieties for you to try. McIntosh, Sweet Sixteen and Honey Crisp are a few weeks out and it looks like we will have plenty of all of them for you to try. 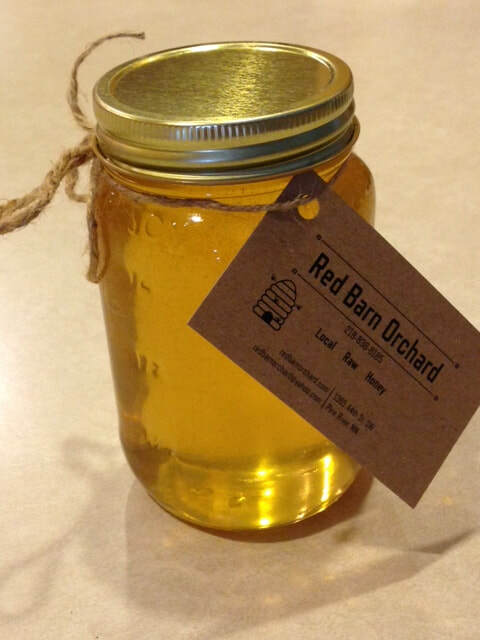 This weekend we will also have Fresh apple cider and honey. Its the last weekend before school starts and it looks like the weather is going to cooperate, so come on out and try your new favorite apple! Lexi will be waiting to greet you! Its State Fair time again and our first up , as it is every year, is State Fair. A very good apple for just about anything. We will also have Chestnut Crab and we might start picking Zestar this weekend. I tried one last night and I think it needs a few more days, so maybe by this weekend, it will be ready. The Chestnut Crab is what I like to call a mini Honey Crisp. Try one and you'll see what I mean. Also, for those of you who have been waiting.....the honey is now extracted and waiting for you! We have alot of people asking about it and its here. The bees were very generous this year again and the taste is excellent. We ran out last year early, so if you want some, dont wait too long. In the next few weeks we will be picking Zestar, Prairie Magic, Hazen and Chestnut Crab. Sweet Sixteen and Honey Crisp are about 3 weeks or so out yet. And of course, we will have cider too! See you this weekend! The time has come and the apples are ready! 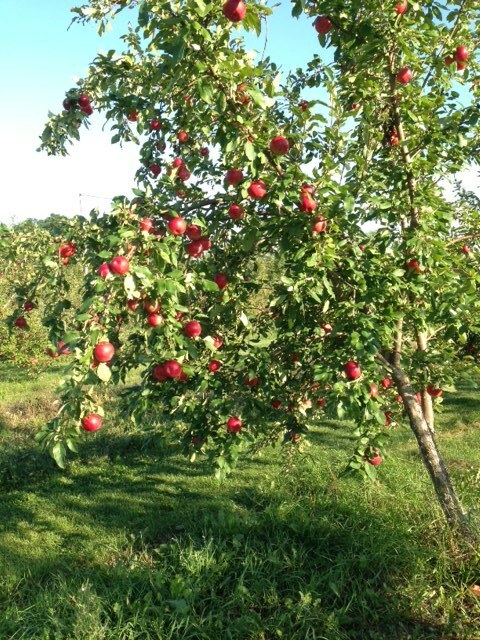 The orchard will be open for the season starting next Saturday, August 18th at 10am. We will be open Saturdays from 10-5 and Sundays from noon-5. In case of rain or other nasty weather, please call or check the website. First up this season, as always is one of my personal favorites, State Fair. This apple is crunchy and tart at the same time. Its great for eating or baking. Its one of the better apples for making applesauce. You can pick this variety if you like. Some varieties we will let you pick and others are pre-picked. 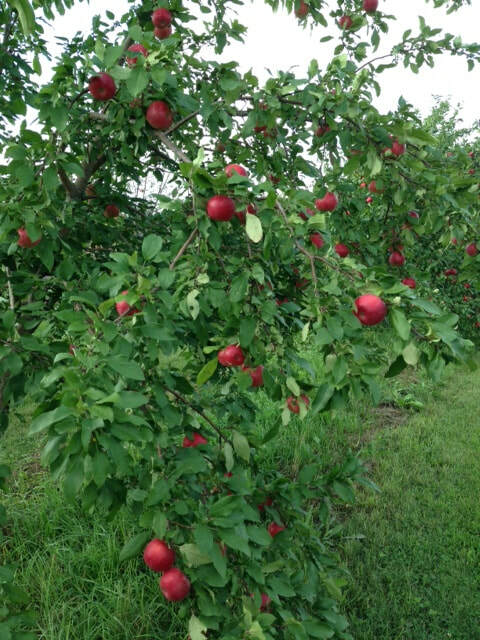 After State Fair, the next apples in line will be Zestar and a new variety, Prairie Magic. Growing apples this far north is always a challenge and this summer was no different. If you will remember, spring was almost a month late and the apple bloom was late as well. Some of the early varieties may not be as big as usual and some will. There is only so much time for them to grow. Time will tell how the later varieties will do. We will have honey in 2 weeks. Thats next on the list of things to do. Heres hoping we have a good fall. See you all next weekend!